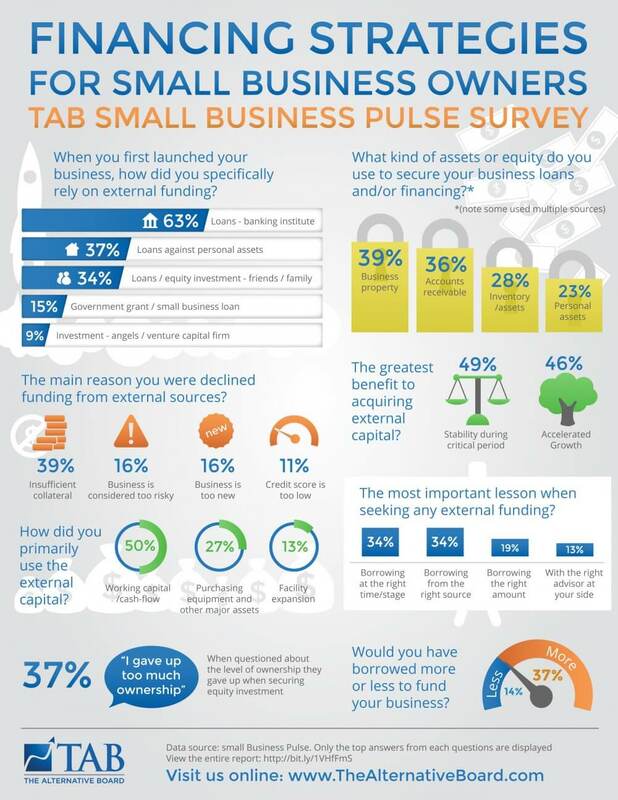 This is a high-level summary of our key findings from the March 2016 Small Business Pulse Survey. This survey concentrated on the strategies, sources and lessons learned raising capital for small businesses. The survey was taken by 325 business owners. These survey results reveal not only how businesses went about raising capital for their businesses but also the challenges they faced and lessons they learned going through this process. Two thirds of respondents self-funded their business when it was first launched. Since launching their businesses, 83% have raised capital using some type of funding source. Respondents found that small community banks (44%) do a better job of serving local business owners than the larger institutions (27%). The top 3 assets used as collateral are: business property, accounts receivable and inventory . However, a significant number of respondents used personal assets (savings, property) to secure the capital. Even though there is a strong perception that it is substantially more difficult to raise capital from banks since the beginning of the recent recession, we didn’t find as big of a gap as we expected. 57% of respondents said it was generally harder and 43% said it was generally easier. However, more than 3 times the respondents said it was “much harder” than “much easier” to raise capital, signifying that some industries or types of businesses still face a significant challenge. Some businesses sought funding but were not able to secure it. The number one reason was insufficient collateral. The next two most common reasons were business is considered too risky and business is too new. If respondents did need to raise additional capital in the future, 51% would turn to loans from a bank or other financial institution. The second-most selected option was investing personal funds into the business. The greatest benefits of securing external capital were stability (it kept my business stable during a critical period) and faster growth (it helped grow my business more quickly than we could otherwise). The main uses for the external capital were working capital / cash flow, purchasing equipment and other major assets and facility expansion. Business owners generally used the external capital wisely. On a scale of 1 to 10 the mean was 8.2 in how well owners felt they used the capital. The most important lessons from securing external funding are borrow at the right time (34%), from the right source (34%), at the right amount (19%) and having the right advisor at your side (13%). The most important advice respondents would give to other business owners is only borrow if you have no other option and borrow aggressively if you can accelerate growth. One very important lesson that business owners learned when securing equity investment is that 37% felt they gave up too much ownership. Most felt that they gave up just the right amount of ownership and only 2% felt they gave up too little. Business owners also indicated that they should have borrowed more rather than less. 29% wish they had borrowed more whereas only 11% wish they had borrowed less. negotiation. This was pretty well split with 53% believing the investor has the upper hand compared to 47% who believe the business owner has the upper hand. business for more than 20 years. The mean number of years is 18.3. 63% of the respondents have annual revenue of $1 million or more. Respondents came from the US, Canada, the UK, New Zealand and Ireland.